Since I was little, I’ve been drawn to rainforest. The way it drips with life. Like a promise that organic life on this lonely planet will live on forever. And anyone who loves rainforest dreams of going to Sumatra, a place where the romantic jungle of storybooks still exists in this age of the anthropocene. Most tourists head to northern Sumatra to visit the rainforest, where it is quite accessible via Medan, Sumatra’s biggest city. There’s a fair bit of tourism infrastructure here and there are also orang hutans (literally forest people in Bahasa Indonesia, otherwise known as orangutans) which are not found further south. But up north, much of the rainforest is quite degraded, with frequent palm oil plantation incursions. That’s why I decided to go to Western Sumatra. Out of ten million foreign tourists visiting Indonesia each year, less than 50,000 make it to Western Sumatra. Of these visitors, the majority are Malaysian, with less than 2,500 foreigners from any other part of the world each year. This is where Kerinci-Seblat is located, Sumatra’s biggest national park by far. It is a mountainous tropical rainforest, home to mouse-deer (tiny deer! ), sun bears, tapirs, elephants and clouded leopards. It also has the most important remaining population of Sumatran Tigers – between 165 and 190 Sumatran Tigers live here out of only 400-500 left in the world. Here, I figured we might get a less commercialised experience of a more intact rainforest. Visiting this part of Sumatra involves some very long travel distances over terrible roads, and there’s limited information about the area available online. But having a penchant for the difficult option, I was undeterred. We flew from Jakarta to Padang on the west coast of Sumatra, where, despite a devastating Earthquake in 2009, we found a friendly, laid-back city where hipster cafes nestled alongside the street stalls. Most non-Malaysian tourists here are surfers passing through town on their way to nearby islands, and we were the subject of much excited attention. One night the lovely young woman who had guided us around the museum picked us up with her friend and they took us on motorbikes through the pouring rain to try the local speciality of leaf-coffee at a cafe. Another day we chatted with some friendly young guys who were competing in the regional Koran-memorising championship. After a few days in Padang, we were picked up by our driver Eddie, who spoke almost no English and was often bewildered by our attempts at Indonesian, but safely manoeuvred us through police bribery-posts, landslides and washed out roads over the course of the next 13 hours – and he even agreed not to smoke in the car – an act of incredible self-denial in Indonesia! 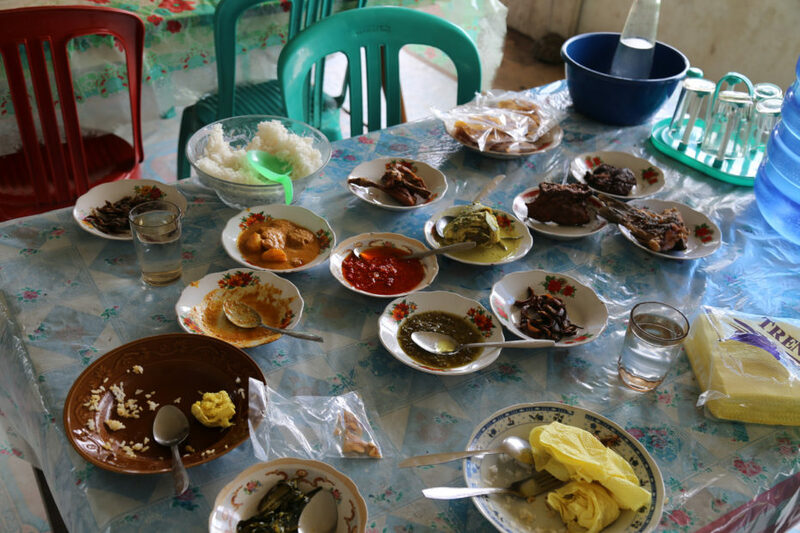 For lunch we stopped at a road-side Padang Restaurant (a cuisine which is actually famous all over Indonesia) where we were befriended by the staff and a volley of selfies, group photos and portrait shots ensued. 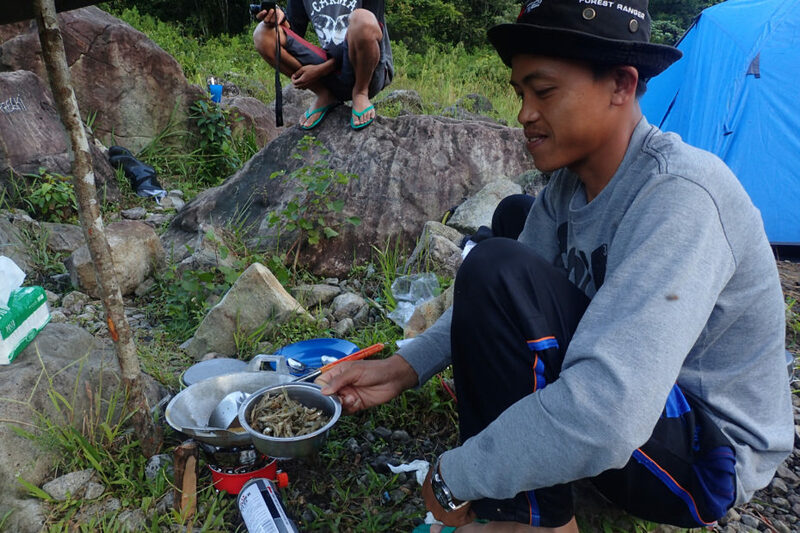 Our destination was Lempur, a village on the edge of Kerinci-Seblat National Park, and when we arrived late at night we were greeted by our beaming, open-hearted guide Zacky, who runs Explore Kerinci and was hosting us in his home before and after our four-day trek. Zacky, his wife Mai and his young daughter also shared their house with a handful of other extended family members. We ate dinner on their living room floor, had a quick bucket shower and crashed out. The next day, we hopped on motorbikes with our huge packs, and were dropped at the edge of the forest, where we began our hike. With us were also our two porters – the mischievous joker Bes and the calm, more reserved Akindo – who also worked as a trained nurse in the local hospital. We traversed forest interspersed with village farmland and swamps, then climbed up a steep, rough motorbike track through forest and cinnamon tree plantations, passing by the occasional buffalo dragging cinnamon bark down the mountain. We found a tiger pug mark in the mud, and I exclaimed ‘Harimau!’ which means ‘tiger’ in Indonesian. Zacky turned to me looking distraught, warning me to ‘never say this word in the jungle’. There is a superstition that saying its name will call the tiger to you. Villagers around the park in Lempur retain a deep respect for tigers and are forbidden from hunting them. For a naïve tourist, the idea of seeing a tiger is exciting. For a wise local, it’s scary. 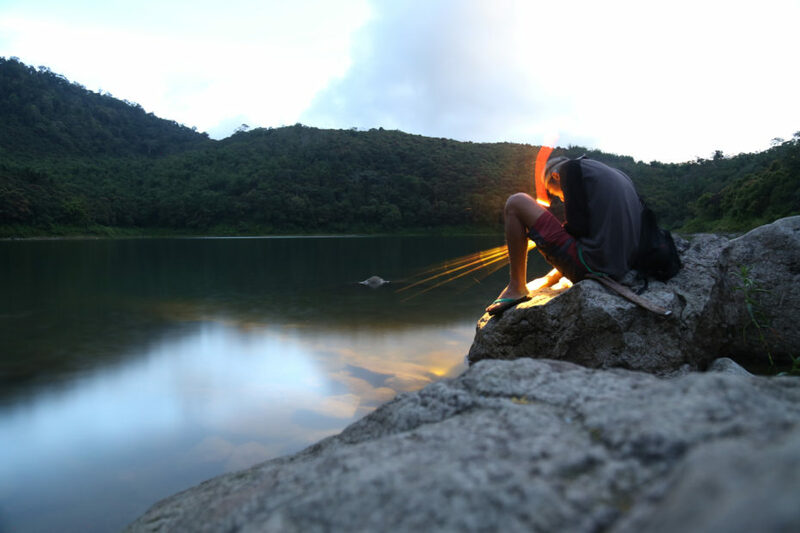 That night we camped on the shore of Danao Duo – a crater lake surrounded by forest, popular with locals as a picnic spot, resulting in a smattering of colourful plastic strewn amongst the rocks. As the sun sank we heard hornbills flying overhead. 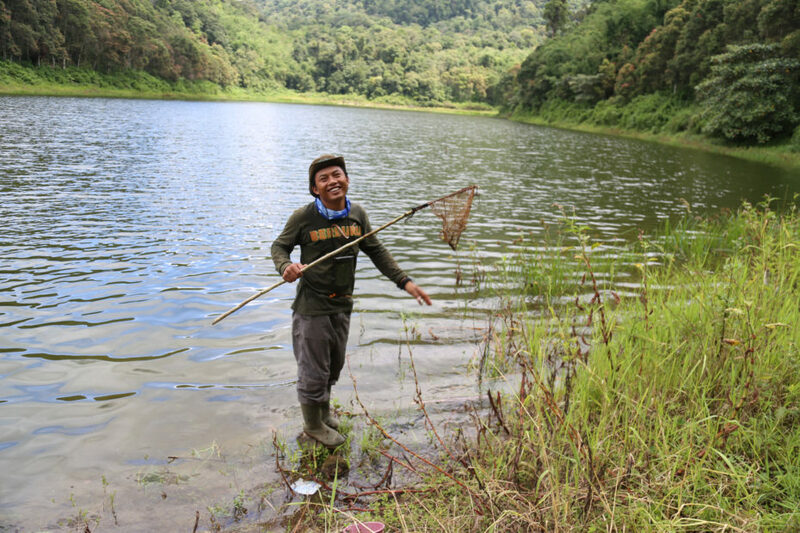 At night, our guides caught fish from the lake by blinding them with red torchlight and Bes fried up the tiny fish whole with chilli and rice. As the sun rose the next morning, gibbons chorused from the other side of the lake and we ate breakfast. I was feeling slow and tired from yesterday’s hike and my stomach was unsettled. In fact I felt distinctly unsteady – the noise of animals and birds seemed to have disappeared and the wind seemed to be rocking my fold-up chair back and forth. There was something really wrong with me because as I stared at the ground it seemed to be shifting too. Earthquake! I had visions of the crater-lake exploding back into life and burying us in a pyroclastic flow. Our guides laughed at me. 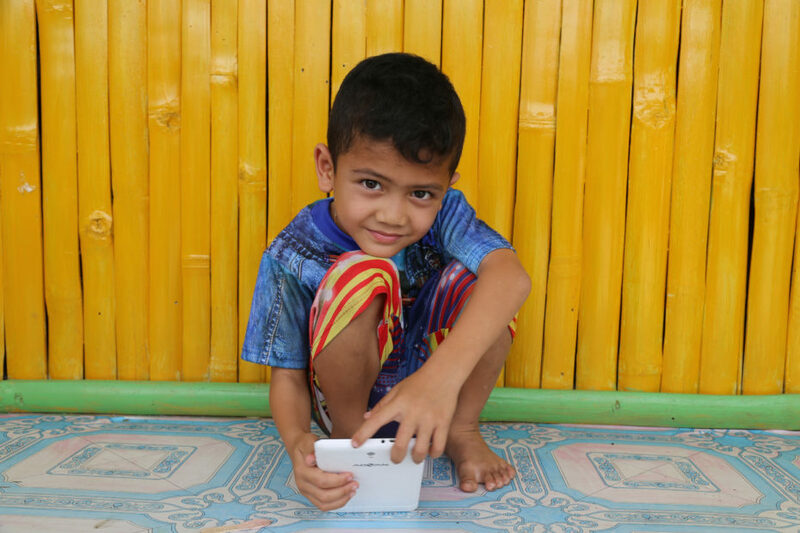 ‘Now tsunami in Mentawi’s’, they joked – islands off the coast from Padang that had indeed suffered a bad tsunami not long ago. After a couple of hours hike further uphill, we passed through one final farm before suddenly – as arbitrarily as a national border – we crossed the national park boundary and stepped into the proper rainforest where mosquitoes and leaches were upon us within seconds! I couldn’t have been happier. It was interesting to have seen the land-use transitioning between the last proper road and the national park boundary, but the real rainforest – this is what I had come for. 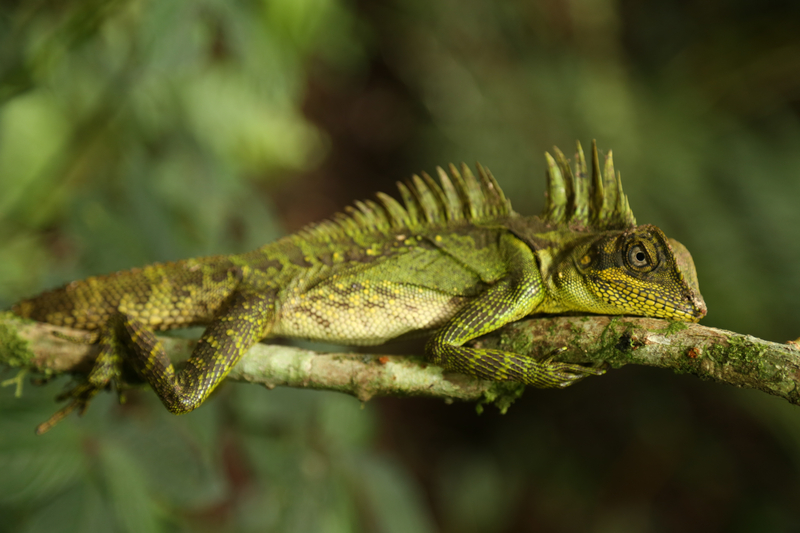 We walked for hours through the forest, hearing and seeing glimpses of birds and leaf monkeys as well as coming across a sublimely beautiful iguana that shuffled around its branch glaring at us as we subjected it to a serious photo-shoot. About an hour from camp the sky broke upon like an egg and the rain came down thick and hard. 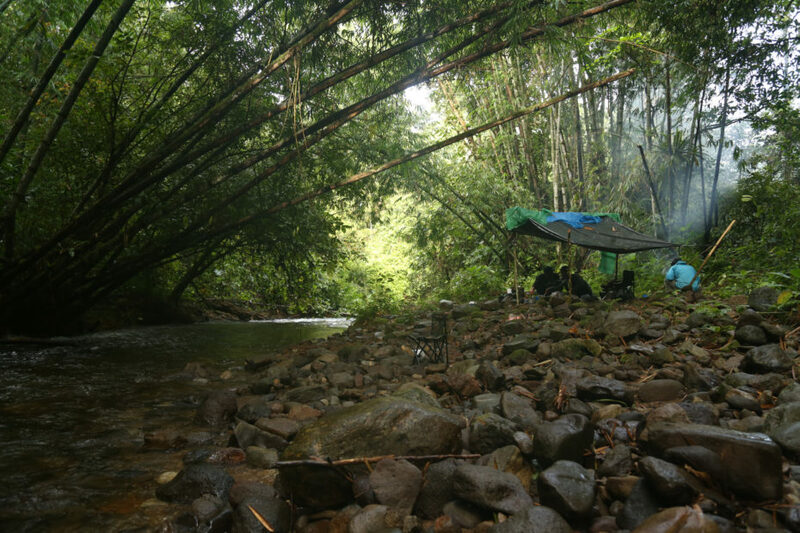 When we eventually got to our campsite on a riverbank surrounded by bamboo, we were all soaked despite raincoats, but huddled under a swiftly erected tarp to drink tea and eat hot noodles till it cleared up and our tents could be put up. It felt strange to have our guides put up our tents for us, cook for us and bring us tea. We had the luxury of two foldable chairs whilst the others made do with the ground. Zacky delighted in calling Simon ‘My Lord’ and me ‘My Queen’ – a joke delivered in his disarmingly sweet, open manner, but also a comfortingly honest acknowledgment of the bizarre power and wealth imbalances that must be negotiated when people from different worlds come together. That night whilst we dried our wet things over a blazing fire, the eerie luminescence of glow-in-the-dark fungi in the trees gave the impression of eyes watching us from the darkness. Later, fireflies floated between the net and fly of our tent, like a bio-powered lamp. The next day the plan was to hike further into the rainforest and camp at an even bigger river. We were well-and-truly off any path now, making it all the more surreal listening to Bes singing ‘My Heart Will Go On’ – the Celine Dion theme song from Titanic. But the rain came down again (it was rainy season after-all) and this time it was a violent thunderstorm that shook the trees. Zacky was worried about branches falling on us. We decided to head straight for Blue Lake, a nearby crater lake, which was otherwise going to be our camp on night four. We altered our route and soon met with the wide, muddy and well-used path to Blue Lake, where it was jarring to see a few bits of rubbish. I picked some up but Zacky told me not to bother as the guides did a dedicated trip to collect rubbish once a month. As we got closer to the lake, it became clear just how pointless my efforts were – the trickle of rubbish became a rainbow-coloured tsunami of plastic. When we reached the lake we looked down at the sapphire-blue crater and it was impossible not to be awe-struck. But around it lay drifts of rubbish that made it feel like we were on the outskirts of a rubbish dump. Emotionally I was crushed. We sat on a log, rain drizzling on our wet, cold bodies, watching fish swimming in the absurdly clear water. I couldn’t understand how people could trash this beautiful place. I had an ugly, angry impulse to just get out of the national park as quickly as possible – to turn my back on it all. I also felt guilty. Rubbish or not, this was a place Zacky was extremely proud of, and I didn’t want him to think we didn’t like it. But he was an observant and sensitive guy and it was impossible to conceal our disappointment entirely. He was clearly embarrassed by the rubbish. And tired. Zacky and his local environmental group had put up signs at the lake telling people not to litter, and visited schools to educate local kids about protecting the environment. It seemed an almost insurmountable task in that moment. I also knew it wasn’t just the rubbish that was getting to me. We’d hiked through the jungle for three days, with the notion of finding somewhere truly ‘wild’. Somewhere untouched by human destruction. And here we were, only three hours walk from the road, at a place where locals and tourists made day-trips. Part of this sharp disappointment was a very selfish thing – I wanted this place to myself. I wanted to feel like the intrepid explorer going where others couldn’t. It was the loss of my own imagined ‘wilderness’. No doubt it was still out there in this park – a place too hard to get to, where animals and trees existed undisturbed. But it wasn’t here. And yet, paradoxically, it was. The trees towering around the lake were cloaked in beautiful mosses and orchids. Squirrels darted along branches and we heard monkeys calling. And Zacky told us how only a short time ago one of his groups had seen a tiger drinking from the lake in the moonlight. At Blue Lake, the rain kept coming down for the rest of the afternoon and through the night. We had an early supper and went to bed, damp and chilly in our tents thanks to Kerinci’s relatively high altitude. With the black night around us, the though of seeing a tiger up close really did feel unsettling rather than exciting. I desperately wanted them to be out there, but I didn’t want one to be out there, prowling around our tent. The 7D experience of wilderness had now diverged entirely from the romantic idea of wilderness. I was reminded once again that being in the rainforest is beautiful, but also uncomfortable, wet and exhausting. Wildlife is elusive and occasionally dangerous. The next morning Zacky, Bes and Akindo collected rubbish and buried it – there was far too much to carry out on top of their existing loads. As we hiked back to Lempur village, I thought about my quest for the ‘real’ rainforest. 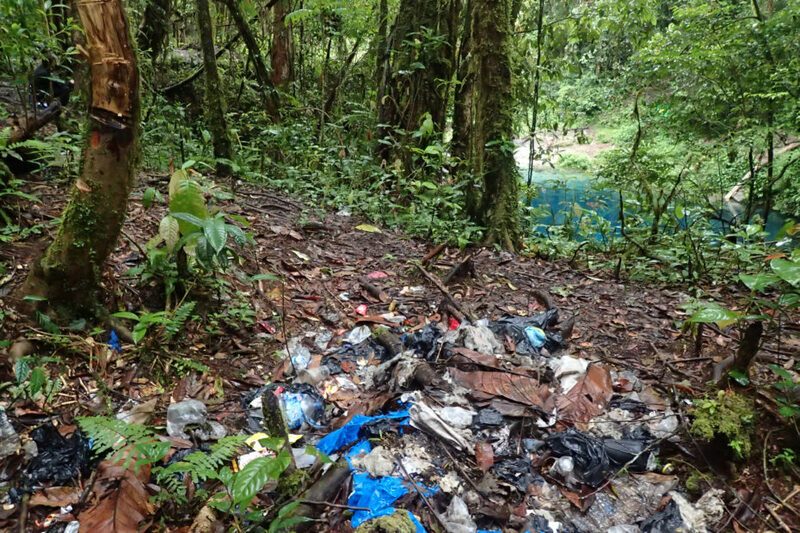 The whole notion was further entangled because I knew that this rainforest wasn’t ‘untouched’ – the park has long been inhabited and used by local people. I definitely wasn’t hankering after the kind of ‘wilderness’ that erases humans from the landscape. There is actually a village of around 300 people deep inside the park, which you can walk through the jungle for 15 hours (probably best split over two days!) to get to. These forests are part of the traditional resources of the villagers, and a small amount of subsistence hunting of non-endangered animals for eating, and the cutting down of a couple of trees here and there for building wood is generally tolerated. 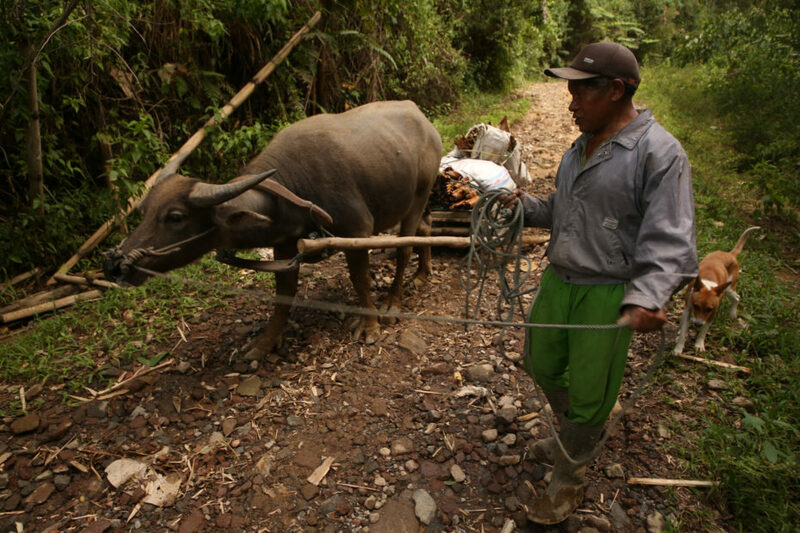 Outside the national park in the buffer zone, traditional management of community forests still occurs, with patches lent to newly married community members for a period of five years, enabling them to access wood to build a house. The traditional co-existence of villagers with the rainforest was theoretically compatible with conservation. But in a rapidly changing Indonesia, could the old rules that previously governed sustainable use of the forest still be relied upon? The park was only legally gazetted in 2000, using wooden and concrete markers to demarcate the boundaries, and encroachment is a real issue. The deforestation rate inside Kerinci is only 0.28% a year, which compares very favourably to the 2.9% a year over Sumatra as a whole. But buffer areas of forest around the park are being diminished and when these are gone the park could be at serious risk. The local community are not comparable with the logging and palm oil companies that can cause wholesale destruction in light-speed time – and which thankfully aren’t a big problem here. Nevertheless, Kerinci’s biodiversity is still slipping away, and quickly. Rubbish is cosmetically offensive, and no doubt reflect on the attitudes of Indonesians towards the environment. But it doesn’t even rate in terms of the most serious threats to Kerinci National Park. Poaching is a serious problem here. Rewind to1997 – I was in my year six classroom, shaking like a leaf, as I gave an impassioned two minute talk on rhino conservation. 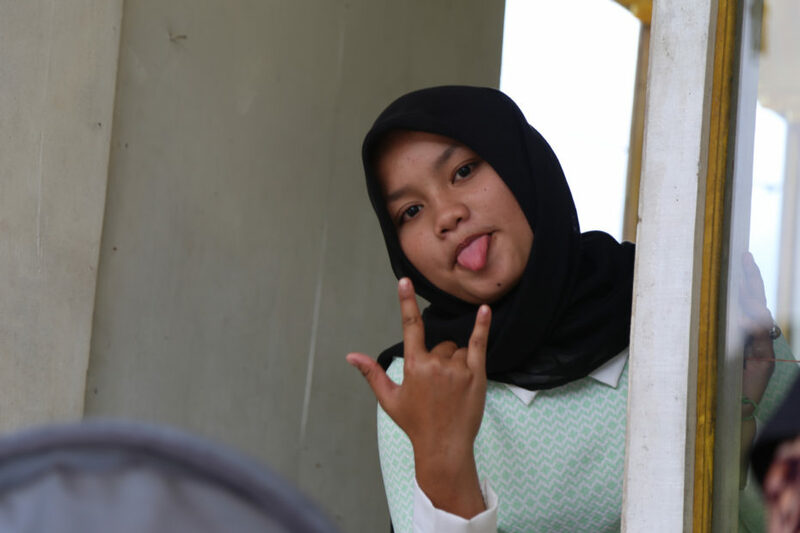 At that moment in time there were 28 Sumatran rhinos left in Kerinci. Ten years later, in 2007, a team was sent in to work out how many were left. These strange and captivating creatures had already vanished, leaving no trace. Snares are laid to catch tigers and deer – in 2015, an all-time high of 72 tiger snares were found and destroyed by ranger patrols. Targeted tiger poaching usually takes place through organised syndicates, with massive demand from Vietnam and China the driving force. A project funded in part by Dreamworld supports ranger-led community patrols (which Zacky participates in) as well as intelligence-gathering on poaching activities, and in recent years a number of poachers have actually been caught though this program. They were only sentenced to a mere year and five months in jail, but even this is an achievement, given intense lobbying by an influential local politician for the case to be dropped. 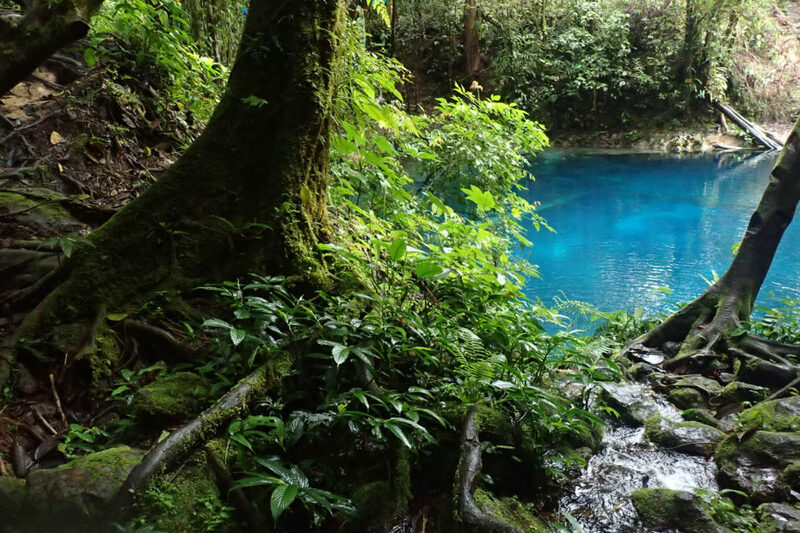 Zacky said that a lot of money had been invested in the park by NGOs, but locals feel that the money has lined the pockets of government officials without achieving real conservation outcomes or development of eco-tourism. Googling, I came across a big World Bank project funded in the late 90’s/early 2000’s, which aimed to integrate conservation and development in Kerinci. Parks staff were trained to use GIS (satellite mapping) software to track deforestation, a website for the park was developed, and for the first time ever, university graduates were recruited and trained as field staff. These seem like practical investments that would surely have improved capacity within the park’s administration. It’s hard to know how much of the funding would have gone directly to these activities, however, and I also read online that a lot of money went to big salaries for consultants. The World Bank project also had a development-focused project, with grants of USD $50,000 per village paid to support agriculture in exchange for the villagers undertaking conservation measures. Contrary to what you might hope, villages that participated were found to have the same deforestation rates as villages that didn’t. The development project didn’t seem to have had any real impact. As un-PC as it may be to say, it seems at least in this case that integrating conservation and development isn’t always the win-win we might wish it to be. Development is essential, but it doesn’t follow that it brings conservation outcomes. Maybe if Kerinci is going to be protected in the longer term, direct investment in conservation by stepping up patrolling and law-enforcement may need to be the main focus? Zacky explained that local people have mixed feelings about the park. They do want to see it conserved, but they also don’t want to be shut out of it, and they want to see some benefits from it. He feels strongly that local villagers – at least around Lempur – are the park’s greatest defenders. Despite their gripes, they do watch over the park, and collectively have the power to function as eyes and ears 24/7. Employing more local people as rangers in the park would help to change perceptions, as would the expansion of fledgling eco-tourism and related employment opportunities. The day after our hike we had lunch in a local restaurant and a man asked us if we’d seen many animals in the national park. We told him about the iguana. He asked us whether we ‘took’ the iguana. We were confused. With an apologetic smile, Zacky explained that the man simply assumed that we would take an iguana if we were lucky enough to find one – they’re worth a lot of money for starters. Plus they’re beautiful and make great pets. We politely explained to the man that we left the Iguana there so that other people would have the chance to see it too, and he seemed satisfied by this answer. Later that night, Zacky mentioned a potential operation on his leg. Somehow I hadn’t noticed in the preceding five days, but Zacky pulled up his trouser leg to reveal a lower leg that curved in like a banana. He had broken it when playing soccer at the age of 16, and having no money to go to hospital, he simply lay in bed for nine months till it healed, badly. Despite this, he had become a tour guide, hiking for days on end for a living. He taught himself English, just as he taught himself how to be a photographer and videographer and had set up a successful local side-business doing wedding photos and videos and family portraits. He even showed us how he’d used youtube videos to DIY weld replica filmography equipment that would have been hugely expensive to buy. And on top of all this, he had become an environmental champion, working to expand eco-tourism, protect the national park and build the community’s appreciation and respect for the environment. Zacky personified initiative. I was totally humbled by his perseverance and success, against the odds. Conservation is never easy or simple, even in an affluent country like Australia. In Sumatra it is an ethical quagmire of competing priorities, inadequate funding and inevitable compromise. And time is running through the hourglass. This is the real, desperate and complicated thing. But Indonesia is changing. There are people like Zacky who have ideas about how to do things better. With enough Zackys, maybe there is reason to have hope. And I do.